Berlin has a lot to offer and children are kept happy in Berlin by the many adventures playgrounds that pepper the city. Jannes from berlin-playgrounds.de helped me discovering them. 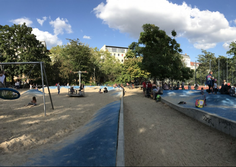 As Berlin Mitte also has a lot of playgrounds, I selected my top 5 playgrounds in Mitte for you. 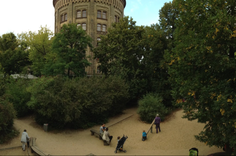 Great playground on top of Weinbergpark, with trampolines, rope pyramid and ping-pong, soccer and basketball court. Big playground at the foot of this water tower. One highlight are the 2 big trampolines. And you can also climb the little hill to get sunshine and a view. 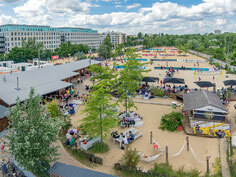 Berlin’s east has many Plansches, which are great waterplay-grounds mostly build during the GDR. The one at Nordbahnhof is centrally located and also has a nice playground attached to it. Located at the number one beach volleyball spot, BeachBerlin, the high rope course MountMitte is a fun place to go climbing. The highest platform is 16 meters above the ground! Altogether there are about 90 different obstacles to overcome. If you’re brave enough and master all courses there is one last challenge for you left: The Skyfall dares you to jump from a 13 meters high spot. 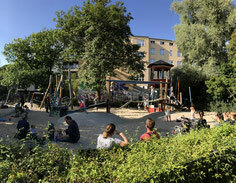 There is plenty of room for fun, adventure, creativity and play for children at the adventure playground Kolle 37 in Berlin Mitte. The Adventurous Playground Kolle 37 in Berlin Mitte is an educational playground. The Kolle 37 building playground began in 1990 on an area of around 800 square metres as a construction site for children's huts.